QINZHOU,CHINA- WBO Intercontinental light flyweight titleholder Jing Xiang of China will face his most accomplished opponent to date when he is pitted against former WBO world minimumweight champion Merlito Sabillo of the Philippines on September 15 at the Qinzhou Gymnasium. They will fight for the vacant WBC Silver light flyweight title. Xiang (14-4-2,3KO’s) beat Filipino Dexter Alimento by unanimous decision for the WBO Intercontinental belt last January in Shenzhen. Xiang’s resume also shows wins against Filipino boxers Rollen del Castillo, Joyjoy Formentera, Joel Taduran and Ben Manangquil. He also lost to a Filipino by third round TKO, Macrea Gandionco, in Kunming three years ago. Xiang actually has the distinction of losing to the current IBF world junior bantamweight world champ Jerwin Ancajas, but this was in 2011 when Xiang had only one pro fight recorded and Ancajas was just another Filipino rising prospect. Sabillo (27-5-1,13KO’s) won the interim world title in 2013 by beating Luis dela Rosa of Colombia by TKO in eight rounds. He would be recognized as regular champion by the World Boxing Organization (WBO) and defended his title twice against another Colombian Jorle Estrada (KO9) and Nicaraguan Carlos Buitrago(split draw) on home soil. In 2014, Sabillo lost his title in Mexico to Francisco Rodriguez by 10th round TKO. He would have a 4W-4L record since then. He lost to Indonesian Elias Nggenggo and to Japanese Ryuya Yamamaka, who would win a WBO world title at 105lbs. In his last fight in February, the 34 year old Sabillo lost to countryman Edward Heno by split decision. For the supporting main event, local heavyweight Wu Zhiyu will be pitted against Japanese Kotatsu Takehara for the WBC ABCO heavyweight title. Wu weighed 109.8kgs or 242 lbs while Takehara was at 110kgs or 242.5lbs. 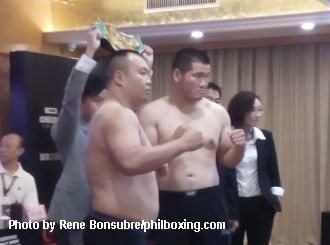 The official weigh-in was held at the Vienna International hotel in Qinzhou. There will be three more bouts on the undercard including Filipino expat Richard Garcia who will face local boy Gao Shichao, Jian Wang vs Wuttichai Wannawong of Thailand and Wu Zefeng vs Chang Yue. This fight card is promoted by Jason Chen’s China Industrial Boxing Industry and sanctioned by the Professional Boxing Commission of China. 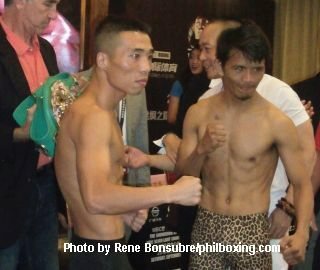 Top photo – Jing Xiang (left) and Merlito Sabillo pose during the weigh-in. Above: Wu Zhi Yu of China (left) and Kotatsu Takehara of Japan.